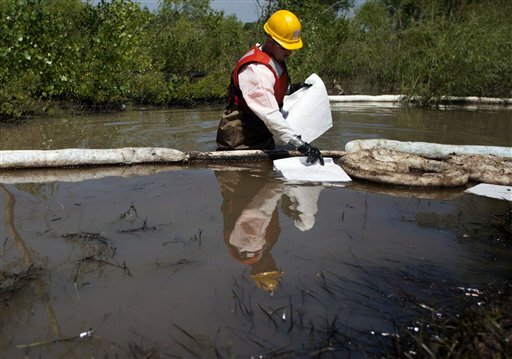 Worker cleans up the aftermath of the oil spill on the Yellowstone River. Federal inspectors found a problem in an oil pipeline a month before it ruptured in the Yellowstone River, but it was not significant enough to force a shutdown, said U.S. Pipeline and Hazardous Materials Safety Administration (PHMSA) officials. PHMSA administrator Cynthia Quarterman, told a Senate committee they found a problem in the Exxon Mobil pipeline in early June, nearly a month before the pipeline ruptured on July 1, spilling an estimated 42,000 gallons of crude into the Yellowstone River. Quarterman declined to offer specifics about what she called an “anomaly” but said officials believed it was not significant enough to require repairs. It wasn’t clear whether the problem detected in June had any role in the July rupture. “Unfortunately, I don’t think that our pipeline inspector thought he had the authority to shut down the pipeline,” she told the subcommittee. Agency officials said a review of pipeline records conducted in June revealed the half-inch thick steel pipeline had about 20 percent external corrosion, based on inspections in 2004 and 2009. The review was part of a larger examination of pipeline records in response to high water flows throughout the Mountain West because of an unusually high spring snow melt. The rupture in the 12-inch diameter pipeline, buried below the riverbed, occurred as the Yellowstone River flooded following heavy rains. Debris, including trees, was floating in the river at the time of the accident. The cause of the spill remains under investigation, but early signs indicate the pipeline severed completely versus springing a leak, according to the Montana Department of Environmental Quality. The findings suggest the river undercut the pipeline which then broke, rather than springing a leak due to corrosion in the line. It will probably be August or September before water levels in the river are low enough to raise the section of damaged pipe responsible for the spill, Quarterman said. It could take another two months after that before investigators identify a cause, and Quarterman said her agency won’t know for certain how large the leak was until it examines records at the oil company’s control room in Houston.